A Millwall football fan who was cleared of manslaughter has been jailed after punching a rival fan who later died. 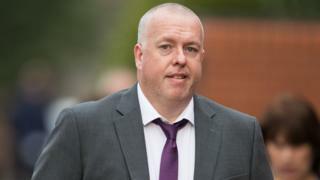 Andrew Lewis admitted inflicting grievous bodily harm on Paul O'Donnell in a car park outside Nottingham Forest's City Ground on 4 August 2017. Lewis, 50, said he used violence against Mr O'Donnell because he was saying "West Ham" at him. Mr O'Donnell was found in a critical condition at his home two weeks later and died in hospital. Leicester Crown Court heard the victim, 56, suffered a skull fracture and bleeding on the brain as a result of the "entirely unnecessary as well as aggressive blow". Miranda Moore QC, prosecuting, told the court Mr O'Donnell suffered from memory loss and severe headaches when he was released from hospital after the initial attack. However, doctors could not say for certain the injuries caused by Lewis were directly responsible for Mr O'Donnell's death, the prosecutor said. Ms Moore said as a result, no evidence would be offered on the manslaughter charge and Judge Gregory Dickinson QC said he would be directing a not guilty verdict. But Lewis, of Bromley, South London, was jailed for two years after admitting one count of causing grievous bodily harm at a previous hearing. Defending QC Matthew Sherratt said: "He [Lewis] has let himself down, he has let his family down and he has let his son down. "He should never have punched Mr O'Donnell and he is sorry." Sentencing Lewis, the judge said: "This was an entirely unnecessary as well as aggressive blow to a man who, at that moment, was incapable of defending himself because he was looking away. "Everyone should be safe to attend matches like this without having to experience or witness violence." The match was won by the hosts 1-0 and had been brought forward by a day to avoid clashing with cricket at neighbouring Trent Bridge.